Open your bottles with Love and offer your guests a fabulous favor that they can use at home after your event. This magnificent bottle opener is crafted from metal with a chrome silver finish. 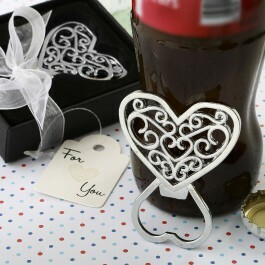 It features a swirly filigree heart design on top with a heart in the centre. The bottom section is the bottle opener. This classy favor comes in a black gift box wrapped with a white organza ribbon and bow. Your guests will be delighted to receive one of these heart shaped bottle openers as a gift! Size 2 3/" x 1 3/4" Filigree heart design chrome metal bottle opener Made from metal with a silver chrome finish Filigree heart design on top with a heart in the centre Bottom section is the bottle opener Packaged in a black bottom box with a clear display top cover Box has a black felt bottom for the item to rest on Box is wrapped with a white organza ribbon wrap and bow Attached to the ribbon is a 'For You' message with a matching filigree heart design in the middle of the white rectangular tag A great way to open your bottle with Love!